The E 12 Coalition has collaborated with the community and partnered with a developer on a plan to build 133 units of affordable housing on publicly owned property near Lake Merritt. 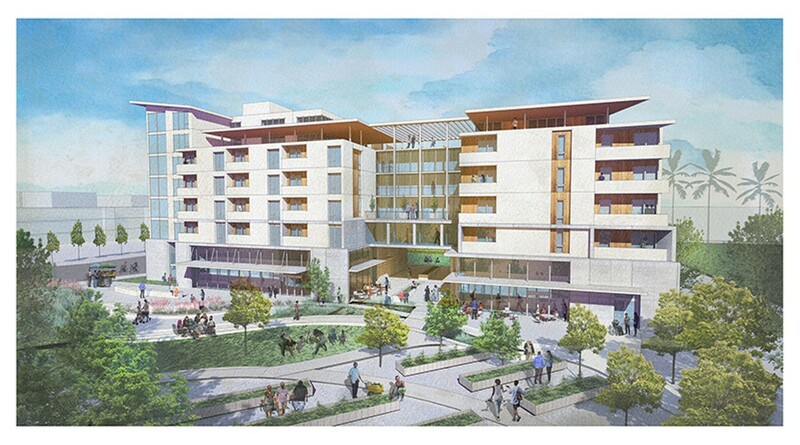 A rendering of the E 12 Coalition's housing proposal. Ayohenia Chaney is an Oakland resident who lives next door to the East 12th Street parcel and Tia Monique is a long-time Oakland resident who was born and raised in the Eastlake area. Both are members of the E 12th Coalition. Every few months, news of another major, market-rate high-rise development coming into Oakland makes headlines. The developers behind the new Uber headquarters are planning two acres of high-rise housing, retail, and office space on a parcel at 21st Street and Telegraph Avenue. The City of Oakland is selecting a developer for the parcel at 1911 Telegraph, hoping to see a high-rise, mixed-used development and a hotel. The Strada group is developing a new, market-rate high-rise and hotel complex at 12th and Clay streets in downtown. All of these proposed developments are on public land. What would it look like if the City of Oakland worked not just with corporate developers, but with neighborhood residents to determine what should be built on our precious public land in Oakland? Residents in the Eastlake area of Oakland believe that this sort of community-led development can and should happen on the publicly owned East 12th Street parcel next to Lake Merritt. The E 12th Coalition, an alliance of neighbors and community groups, spent months protesting the city's plan to sell the public parcel to private developers for a luxury apartment tower with no affordable housing and in violation of the state Surplus Lands Act. Once the parcel was opened up to new development proposals in July, our coalition quickly switched gears and began envisioning what should be built on the land. We started with the community outreach that the City of Oakland and the developer should have done. We surveyed hundreds of Eastlake residents in multiple languages. We hosted a community design forum, during which two hundred residents gave feedback on how to use the parcel. A team of volunteer architects and designers crunched the data, distilled community design principles to guide development, and put together a comprehensive site plan. We partnered with a well-respected affordable housing developer, Satellite Affordable Housing Associates, which recently completed a 100 percent affordable building for seniors just a few blocks from the East 12th parcel. The result from this extraordinary collaboration involving the community, volunteer architects, planners, and professional developers is a visionary, medium-rise building for mixed-income residents — though still 100 percent affordable. 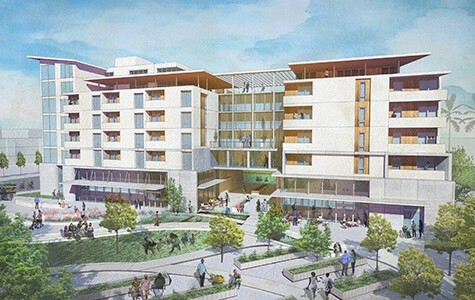 The project will blend seamlessly into the neighborhood and is designed to create connections between neighbors in the Eastlake area, residents in the new building, and the public treasure of Lake Merritt. The design includes 133 units of which 85 percent would be for individuals and families making 60 percent or less of area median income. Recognizing the benefit of mixed income developments and the dearth of workforce housing, the building also includes eighteen units for moderate-income residents. The building maximizes occupancy density. It can house more than seven hundred Oakland residents — at a time when every day we hear stories from our neighbors of being pushed out or evicted from their apartments due to rising rents. Our proposal is designed for working families, with a majority of two- and three-bedroom units. The building includes spaces for community and commercial use on the ground floor and environmentally friendly features such as community gardens and rooftop solar panels, along with electric charging stations in the underground parking lot. It includes public open spaces, leading down to the renovated pedestrian walkway along the Lake Merritt estuary channel. More than 200 Oakland residents and 25 local community organizations, service agencies, faith groups, and legal advocacy nonprofits have submitted enthusiastic letters of support for our proposal. The East 12th parcel is public land, and there is a growing recognition that public lands represent unique opportunities to build affordable housing, especially when we now live in the nation's fifth most expensive rental market. In San Francisco, voters just passed Proposition K, which prioritizes using public land for affordable housing. The City of Oakland and PolicyLink's Housing Equity RoadMap, released earlier this year, made a similar recommendation. A recent report produced by a UC Berkeley public policy student showed that out of 21 surplus public lands in the city, only one other — besides East 12th — is suitable for affordable housing. During our community engagement process, hundreds of Oakland residents shared their ideas and created illustrations of what they want to see on the East 12th parcel. Not a single person mentioned or sketched a market-rate tower, and, in fact, for months, residents across Oakland expressed outrage at the idea of a luxury tower on public land. Even though there are several other proposals for the site, including a project that proposes a tower with some affordable housing tacked on in a separate unit, the reality is — and numerous housing and development experts have testified to this — any tower in Eastlake will exacerbate rising rents and increase displacement. No token inclusion of affordable housing units will change the fundamental and inevitable negative impacts of a luxury tower. By partnering with the E 12th Coalition, the City of Oakland has the opportunity to establish and promote a replicable regional model of community, developer, and city collaboration for affordable housing on public land. Our community coalition has offered up a solution to the City of Oakland. We used our volunteer time and resources to facilitate an inclusive public process. We ran the numbers to show our proposal is financially feasible, while meeting both the letter and the spirit of the Surplus Lands Act. We put together the design. We are partnering with a developer. City of Oakland, it's your turn to lead.